Are you ready to push the boundaries of computer science? 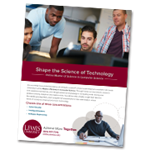 Create future-shaping innovations with Lewis University’s online M.S. in Computer Science (MSCS). Through hands-on coursework, research and capstone experiences, you will learn advanced computing while honing your problem-solving, analytical and creative abilities. Gain highly valued tech knowledge and skills in this rapidly growing field, and get ready to shape tomorrow’s technology in dramatic ways. Outcomes-based learning that allows you to gain in-depth knowledge and experience in developing enterprise-scale applications, database systems, security solutions and intelligent automated systems. Research in computer science through a course that teaches you how to conduct independent scientific research in computing and ongoing course content throughout the curriculum that helps you improve your research skills. Through these experiences, you’ll become an innovator who builds upon the rich culture of forward thinking that characterizes the computing field. Experienced faculty who have tremendous industry experience and who share their passion for computer science and the latest learning in a fast-changing field. Artificial Intelligence Concentration: Learn how to design and implement computing systems that perceive, act and learn. Use machine learning techniques to improve the performance of computer-based systems and create experience-based models for solving problems. Learn how to build systems that can collect and respond to various sensor measurements and how to design networks that communicate and coordinate responses to environmental signals. Cyber Security Concentration: Learn how to identify, monitor and investigate organizational cyber-threats, as well as how to recommend steps and create responses to combat them. Become an expert in encryption and authentication systems, and learn how to design software and networks that mitigate cyber attacks. Gain the ability to specify tools and architectures that proactively and reactively secure information systems. Software Engineering Concentration: Learn how to develop software for a variety of platforms and systems, including mobile devices and the web. Design data storage systems that solve problems, and incorporate security controls and protections throughout the software design and implementation process. Learn how to document and model software solutions to facilitate collaborative development and how to develop and follow testing strategies to verify a software solution’s proper function and security. Data Science: Acquire essential skills in data mining, data visualization, predictive analysis and data management. Choose from two concentrations in Computational Biology and Bioinformatics or Computer Science. Certificate options are also available. To learn more about the MS in Computer Science online, complete the form to the right to request more information or contact the admissions office at (866) 967-7046. *Depending on previous academic preparation, applicants may need to take up to 18 additional credit hours in Foundations courses for a total of 51 credit hours and potentially two additional semesters. Are you ready to push the boundaries of computer science? Create future-shaping innovations with Lewis University’s online MS in Computer Science (MSCS). Through hands-on coursework, research and capstone experiences, you will learn advanced computing while honing your problem-solving, analytical and creative abilities. Cyber Security Concentration: Learn how to identify, monitor and investigate organizational cyber-threats, as well as how to recommend steps and create responses to combat them. Become an expert in encryption and authentication systems, and learn how to design software and networks that mitigate cyber-attacks. Intelligent Systems Concentration: Learn how to build systems that can collect and respond to various sensor measurements and how to design networks that communicate and coordinate responses to environmental signals. Software Engineering Concentration: Learn how to develop software and testing strategies for a variety of platforms and systems, including mobile devices and the web. Design data storage systems that solve problems, and incorporate security controls and protections throughout the software design and implementation process. It’s packed with program details courses and more. To get yours and speak with a Graduate Admissions Counselor, complete the form below.